It may have been the jet lag. He said through his interpreter that he liked every single performance. Equally. This infuriated presenter Maria Di Filippi who made a big joke out of it. She said that she was under pressure from her boss to get De Niro, a man of few words, to express a clear judgement about the acts which are almost always incomparable and from entirely different genres. De Niro held the course. He was asked, for example, to give a grade from one to ten for a singer and he gave him a ten. Then crafty Maria asked him to give a grade to his dancing opponent but only on a scale of one to a nine. 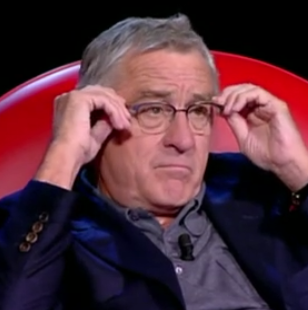 De Niro reflected for a moment and said, "If nine means ten, then I give him a nine." Score: De Niro, one; Maria, zero. Later on when he had to decide between a band and a classical dancer, Maria took out five euros. If you were walking the streets of New York and you only had this bill, which act would you give it to? I would either get them to make change, he replied deadpan, or I would have them rip it in half on the condition that they go to spend it together. Score: De Niro, two; Maria, zero. Oh Maria, it is getting embarrassing now. 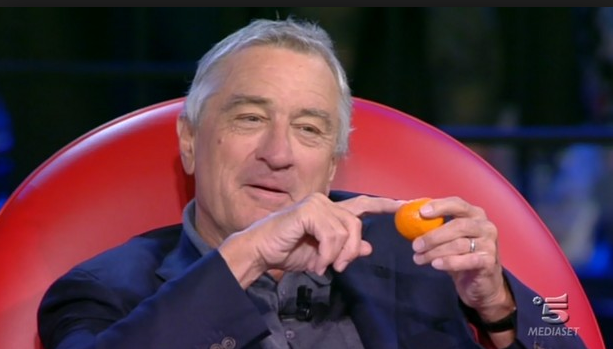 Unperturbed, she gives De Niro a clementine. She says if you had to give it to the solo singer Giada or to the ballerina Federica, to whom would you give it? Then she says, "Decide carefully because inside this envelope I have a surprise." De Niro turns to the interpreter, for whose job I would give almost anything btw, and says, "But she has to tell me what it is." "No," says Maria, "you do your thing with the mandarino and I'll do mine." At this point, Robert looks like maybe the vacation in Italy was not worth all of this aggravation after all. "I'm dividing the mandarino in half," he pronounces finally and without ever having cracked even one smile. "I thought as much," says Maria. She unwraps the envelope to disclose that inside is a single almond. Whether it is Maria or De Niro who is coming more unwrapped as the show goes on, is now up for grabs. 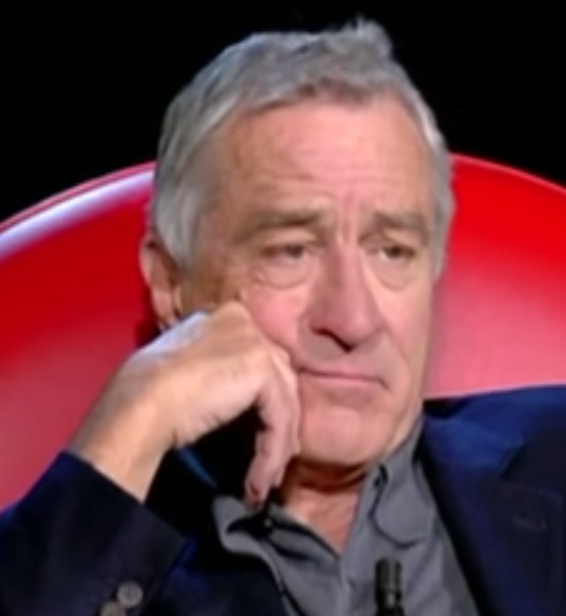 De Niro gives Maria a nasty look and says, "I'd have them flip for it," or testacroce as they say in Italy. At this point, the girl contestants join in the game and hide their hands behind their backs to show that they can't flip for it. Maria then says basically: "You have one %$#% almond, TO WHOM DO YOU GIVE IT? You are FREGATO/screwed!" He says maniacally that he'd cut the almond in half. 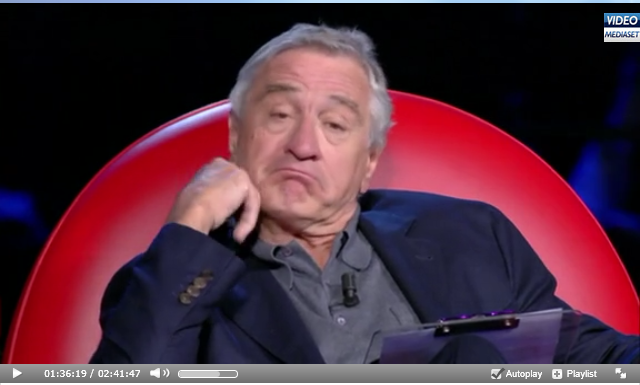 "It's not that difficult," responds De Niro. "They are so terrific in their own ways, how can I choose one over the other?" She says, "I'm not done yet. I am going to find you something indivisible," and stalks off. I can't make this stuff up. Score: De Niro, three; Maria, zero. Kylie Minogue was also there, randomly, to duet with Debora, if you care. In round four, Maria takes out a gold chain. She tells De Niro that the decision to be made is between the duet team of team blue and that of team white. You can't split a gold chain in four pieces, she reminds him. Like a stubborn famous Italian American Mr. Rogers, De Niro insists that they could cut the chain in two and give it in reduced dimensions to their respective future children. Maria demands that he give a handshake to the best singer of the bunch. At the end, it is Maria who is fregata/tricked yet again, as you can see below. 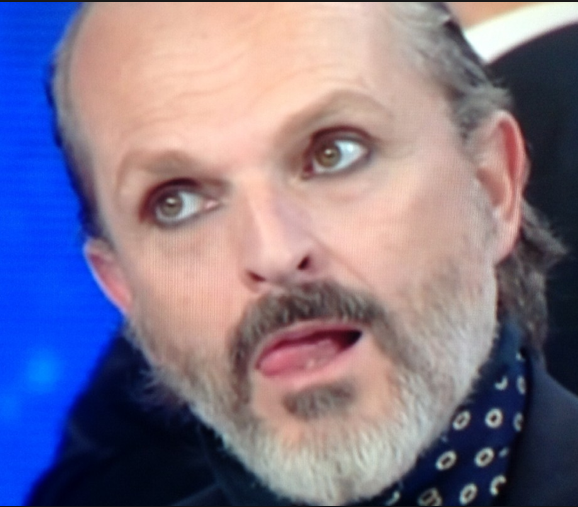 At the end of the show, the leader of the losing blue team, Miguel Bose', goes on to say that he is disappointed by De Niro who went to such great lengths to be impartial, but whom he suspects, when he was forced to vote at two different juctures on his ipad, with help from his tech savvy interpreter, voted for the white team. This was not deigned, to my great displeasure, with a reaction shot of any kind. 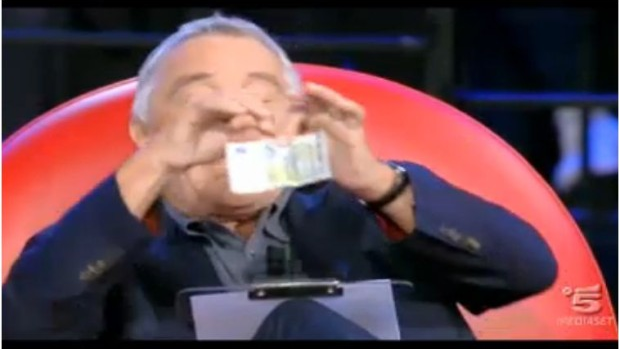 The producers of Amici are not about to disrespect Vito Corleone in any event. Finally, with the show behind him and only the final performance of Kylie Minogue wearing this painted on dress in front of him, RDN does something unexpected: he smiles. . .
and he puts on his glasses, of course!